Atlas Chiropractic – What is Advanced Orthogonal? The Advanced Orthogonal Technique is a very precise adjusting approach which utilizes state-of-the-art, percussion instrument, sound wave adjusting. The Advanced Orthogonal procedure offers patients a gentle and precise treatment for the correction of upper cervical subluxations. I can tell you that I find this to be a very common occurrence, as a result of some kind of head, neck and/or shoulder trauma during one’s lifetime. It can be much exaggerated as can be observed in older people who are bent over but it can also be so subtle that it is almost invisible to the untrained eye. It manifests itself in many postural and symptomatic ways. For each person the symptoms and severity of symptoms which one can experience may vary. The outward postural changes which can occur following a subluxation of atlas (C1) and/or axis (C2) mostly show up as a tilted head, rotated chin, shoulder height change, hip height change, scoliosis and a ‘functional’ short leg. The diagram (left) below shows normal alignment of atlas to the horizon and right when the atlas is subluxated. My note: in simple terms the human skeleton is ‘top down design’ not ‘bottom/feet up’. This means your posture is driven by the position of your head in space. 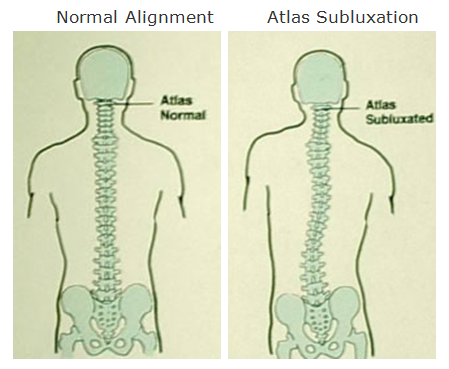 How is the atlas subluxation corrected? Before correction can be made, the Advanced Orthogonal approach uses the most accurate assessment of spinal misalignment. 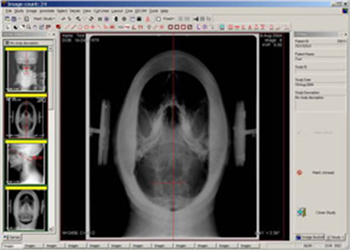 This assessment can only be obtained by looking at very precise x-rays from all 3 dimensions. The views are left (sagittal or side), center (nasium or front) and right taken from above (vertex). These 3 views provide the upper cervical doctor with a good understanding of how the atlas has misaligned with regards to the skull above and the axis below. Additional education and training is required to learn how to read and interpret these x-rays. Upper cervical doctors utilizing the Advanced Orthogonal have acquired that additional education. They use the x-rays to determine a unique listing for the patient’s specific atlas misalignment (precision x-ray analysis). The information obtained allows the doctors to determine the correct vectors (approach angles) for each patient’s upper cervical misalignment from which to make the appropriate adjustment. That is, the adjustment is specifically tailored for each individual patient. Following the determination of the patient’s unique misalignment vectors the Advanced Orthogonal doctor is now best placed to make very specific upper cervical adjustment to re-position the misaligned atlas to its correct position anatomically. As mentioned these very specific adjustments are tailored for each patient’s measurements of misalignment. The actual adjustment is painless and precise and cannot be felt by the patient. 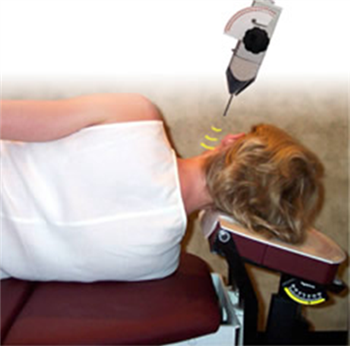 Advanced Orthogonal sound wave adjusting minimizes patient discomfort while maximizing the accuracy of upper cervical spinal misalignment correction. This would have to be the gentlest upper cervical adjustment one could ever experience. With the increased accuracy of Orthogonal chiropractic, Advanced Orthogonal doctors have higher expectations for correcting patient subluxations. The optimum goal for spinal care should be to get your spine to HOLD its own proper alignment…requiring less and less adjusting. These are the goals of Orthogonal chiropractic care. For more information on the Advance Orthogonal approach to wellness visit www.advancedorthogonal.com.